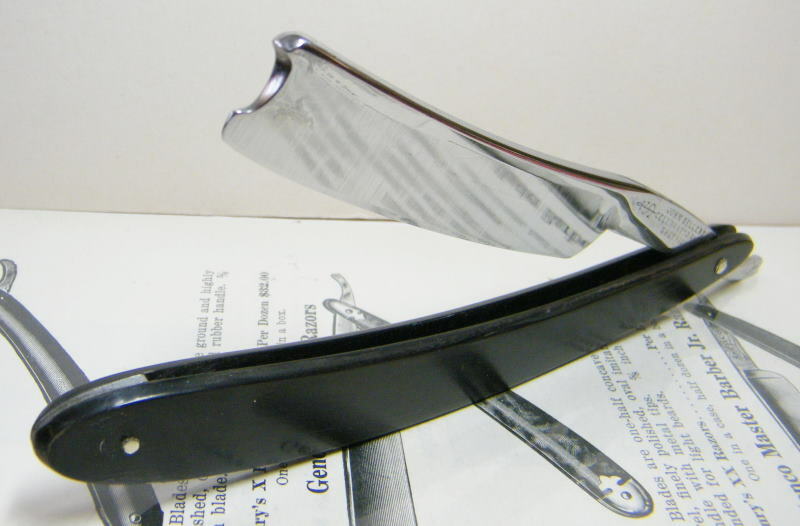 STRAZORS.com - all about classic razors - John Sellers, Sheffield. The firm was apparently established in Sheffield in 1820 by John Sellers (c.1793-1855). However, it didn't appear in directories until 1833, when John Sellers was making pen-knife blades in Rockingham Street. He added the manufacture of surgeon's instruments and also steel and copper plates (and tools) for engravers. The latter was to become an important speciality and eventually included transfer plates, steel dies, monogram dies, cutlery, and patent etching ground. By 1847, John Sellers had opened an office in Pearl Street, New York, and the company displayed at the New York Exhibition in 1853. It had also exhibited at the Great Exhibition (1851), where its products included - besides steel plates and engraving tools - "Wharncliffe" and "Congress" knives, the "Harewood knife", "Norfolk knife", "Rutland knife", "Walton fishing-knife", and "Wilkinson knife". The Sellers' family lived in the suburb of Heeley. John Sellers died there on 5 August 1855, aged 62. The firm was restyled John Sellers & Sons by the founder's three sons: William Bush Sellers (c.1823-1880), Alfred Sellers (c.1825-1882), and Abraham Sellers (c.1828-1877). Alfred apparently withdrew from the partnership in 1870. In about 1862, the firm moved to Arundel Street, where Sellers had a three-storied medium-sized "wheel" that still stands. About 45 workers were employed in the 1860s and 1870s, though that number is said to have increased to about a hundred towards the end of the century (Sheffield & Rotherham ... Up-to-Date, 1897). Besides engraving plates and tools, Sellers continued to manufacture fine table cutlery, pen and pocket knives, sportsman's knives, and hollow ground razors. Silver and electro-plated wares were another speciality, besides nickel-silver spoons. Sellers' corporate mark (granted in 1838) was a dagger entwined with the letter "S". In 1890, the adjacent table knife firm of Richard Elliott and its "EXTRA" mark were acquired. Between the 1850s and 1900, the firm continued to operate a New York office, which was usually staffed by one of the brothers. American banknote printers continued to buy the firm's engraving plates. Abraham died in Halsey Street, Brooklyn on 30 March 1877. Within the next five years, the remaining two brothers died. The management of the business was continued by John Sellers (b.1851), the son of Abraham, and William Bush Sellers (b.c.1860), the son of W.B. Sellers. John managed the Sheffield factory, while William staffed the New York office in Day Street and sol cutlery despite the rising US cutlery tariff. Sellers remained at No.151 Arundel Street in the 20th century. In 1912, John Sellers retired. In 1914, the firm apparently employed about 170 workers. After the WWI, John Arthur Sellers (John's son and the great-grandson of the founder) became the senior partner. Sellers appear to have dropped cutlery manufacture by the 1950s (though it still made engraving plates). It ceased business in 1975.